Fans of the Digimon Story: Cyber Sleuth game was met with a fun turn-based action RPG that pit Digital Monsters against each other. However, it’s much more complicated than just two Digimon fighting one another. 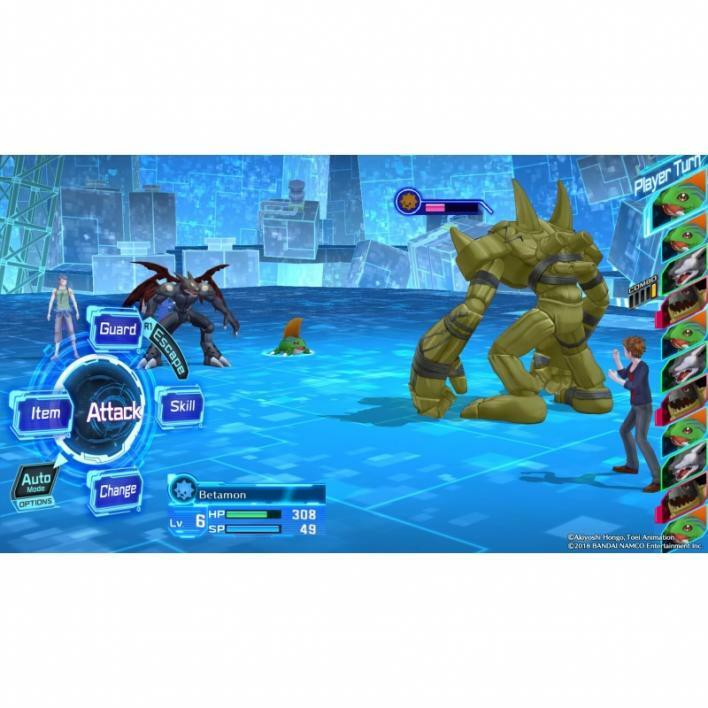 There’s a lot that goes on during Digimon Battles in Digimon Story: Cyber Sleuth Hacker’s Memory that those who are new to the series may not get right away. That’s why we’ve compiled this Battle Guide for anyone looking to jump into some Digimon Battles. The basics of fighting in Hacker’s Memory are rather easy once you identify what you can actually do and the interface. During Digimon Battles, the first aspect of battles tamers will want to be aware of is the Timeline. This reveals the order of actions in battle and can be located on the right side of the screen. 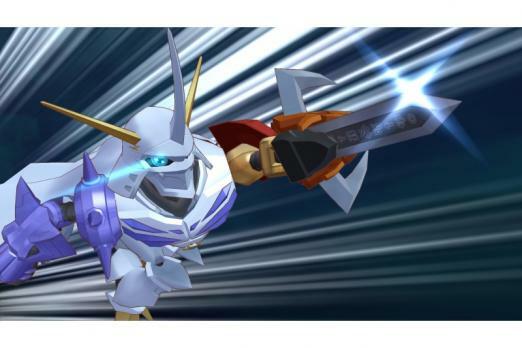 The order of which a Digimon takes their turn in battle is dependant on the Speed stat, which we will get to in a bit. 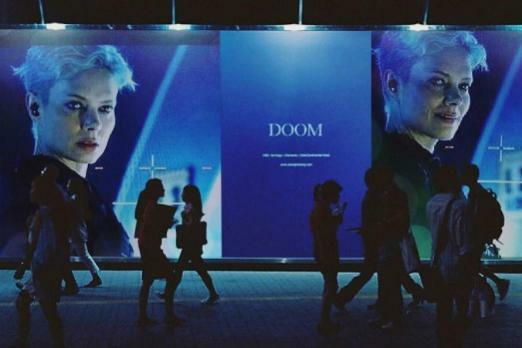 A good rule of thumb would be to try and take out a Digimon who is the closest on the Timeline to making their attack. The Digimon on your side of the field will always present the amount of HP and SP that they have. Health Points determine how much damage your Digimon can take while SP determines how many times your Digimon can use a Skill. ATK is your attack stat that determines your Digimon’s normal ATTACK strength. DEF is how well your Digimon can take hits. INT is your Digimon’s INTELLIGENCE that determines your Digimon’s SKILL strength. SPD is SPEED and helps determine the battle’s turn order. If your Digimon’s speed is large enough, it can attack more than once in a row. CAM is your Digimon’s CAMARADERIE stat. Where you look at the turn order during battle, you’ll see a gauge. If you’re new to the Digimon franchise you may be unaware that the Digital Monsters have types and attributes that are used to classify them. 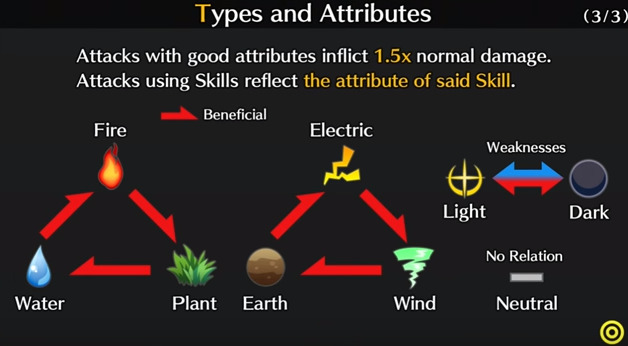 However, types and attributes are something that tamers will need to memorize to succeed in battle. 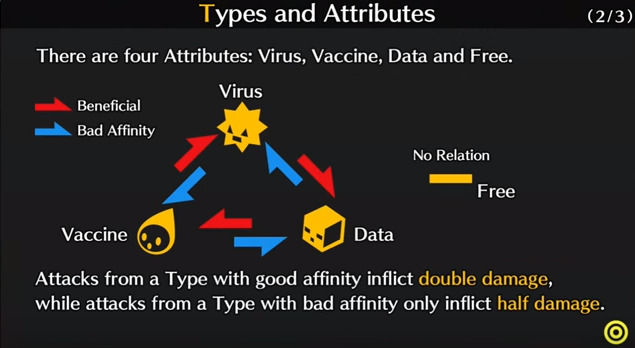 There are four types: Virus, Vaccine, Data and Free. 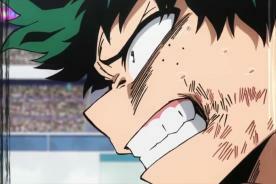 Attacks from a type with good affinity inflict double damage, while attacks from a type with bad affinity only inflict half damage. Attacks with good attributes inflict 1.5x normal damage. Attacks using Skill reflect the attribute of said Skill. In battle, certain Digimon Skills may inflict Abnormal statuses or Stat Changes to other Digimon. 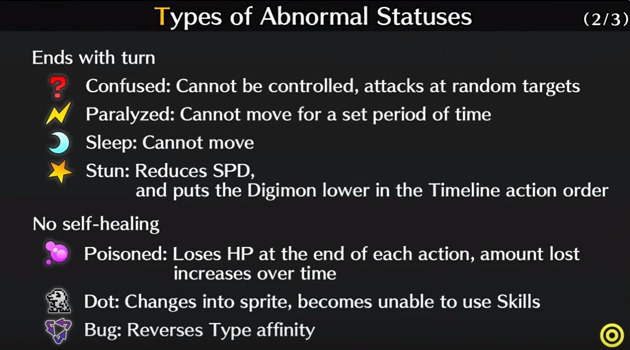 Abnormal Statuses have unique effects such as draining HP every turn or altering stats. These are undone at the end of battle. Here’s a list of the abnormal statuses in Hacker’s Memory. Stat changes continue for five turns after activation. Activating the same stat change during this period will reset the turn count to five turns and stack the effect. Here are the various stats that can be increased or decreased in battle. 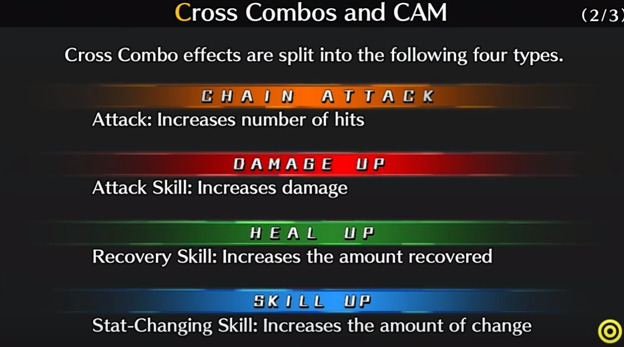 There are four types of Cross Combos that can be performed in battle. The occurrence rates of Cross Combos are displayed on the timeline. The bigger the gauge number, the higher the rate. The gauge fills as you attack, and Digimon with higher camaraderie will have a higher occurrence rate. To build camaraderie between Digimon, you simply have to have them battle together. Outside of the regular attacks, Digimon can perform Skills in battle. There are three types of Skills that Digimon can use. The first is Special Skills, which are Skills that a Digimon knows from the start. Inherited Skills are gained after digivoling or de-digivoling. 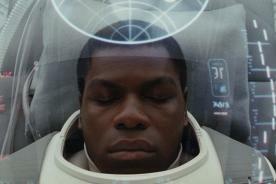 Previously known Skills can be re-learned by leveling up. You can set up to six special move or inherited skills. A Digimon can learn up to 20 different skills. Once the number of skills exceeds 20, excess skills must be deleted. Support Skills are possessed by a Digimon and only activates if a Digimon is in battle and it always affect all battle participants. A support skill becomes ineffective if they can no longer fight. Are you enjoying Hacker's Memory ? Did we miss anything? Let us know in the comments section below.